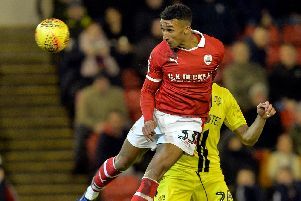 Jordan Green is ready to make his mark for Barnsley after bagging his first goal last weekend. Green, a January arrival from Yeovil, scored a late goal in the 3-0 romp at Southend on what was his fourth substitute appearance. The 24-year-old, who has spoken of his journey from shelf-stacker at Waitrose to professional football, admits it has been a big step up from the bottom end of League Two where he was playing with the Glovers. But he feels he is now up to speed and wants to help the Reds get over the line in the League One promotion race. “I just came on and gave it my all,” he said of his Roots Hall cameo. “That's all I can do. I used my strengths and it paid off in the end. “I think I am ready to start, but it's just about what the gaffer says, he's in charge, he knows what's he doing, so I have just got to be patient. 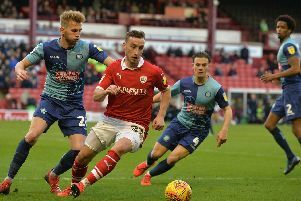 “I have come from the bottom of League Two to the top of League One so the intensity is higher, the standard is higher. It just about me getting my levels up there and I think it is coming to the time where that is happening now. “I am happy to come on and score and show what I am about. With his lightning pace, boss Daniel Stendel believes the winger can make an impact in the final 11 games. “We have good players, we have all players. Without Keiffer, we have no injured players at the moment,” Stendel said. “Jordan Green...he needed a little bit of time. “The first game was a good start and in the last two weeks his performances were getting better. “He said he would score, and he did.